Craig Taylor, associate director of Medicare Solutions, interviews agent Blake McCoy to provide additional insight on marketing D-SNP plans. Are you taking advantage of all of the great plans, rates, incentives and programs Mutual of Omaha offers? Here are 12 reasons why it’s good to sell Mutual of Omaha Medicare supplement plans to clients. Another Annual Enrollment Period (AEP) is complete. This year's record-breaking activity revealed insights about the direction of senior health marketplace, with lessons that can help your business grow. Make it easy for consumers to find you. Add your listing to the Medicare Supplement Insurance Agent online directory provided by the American Association for Medicare Supplement Insurance. Being given the outpatient observation designation during a hospital stay can cost your Medicare clients thousands if they need skilled nursing care afterword. It’s a rapidly growing issue, and legal action is underway to address it. Top producers expect the best of everything. 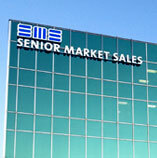 Discover what separates Senior Market Sales from all the others. Discuss issues that are important in the senior market, ask questions, and get immediate access to SMS content and insights by following SMS on social media.